For years the City of Tempe has been planning a streetcar. The routes have changed. They plan to use “free” money from the federal government. They don’t have the money to maintain the streetcar. It’s another feather in somebody’s cap, or an under-the-table deal of some sort. There are endless excuses from Council to construct the streetcar. Maybe the bike lane hoopla was to be a distraction for the overtaxed residents, all the while the streetcar project can be firmed up behind the scenes. Oops is right!! We are paying Ms. Keller who knows how much money to speak for a streetcar that isn’t born yet and the minutes from two recent meetings are missing. Is she not doing her job or is there information the City of Tempe doesn’t want us to see? Doesn’t this sound nice? The invite says Tempe officials will be present to answer questions. Will they divide the group up so we can’t hear each other’s questions? Will they cut the meeting short if the audience doesn’t agree with their overpriced, unnecessary project? Will Mackenzie Keller post minutes of the meetings? Will the meeting be recorded so those not in attendance can see how it went? 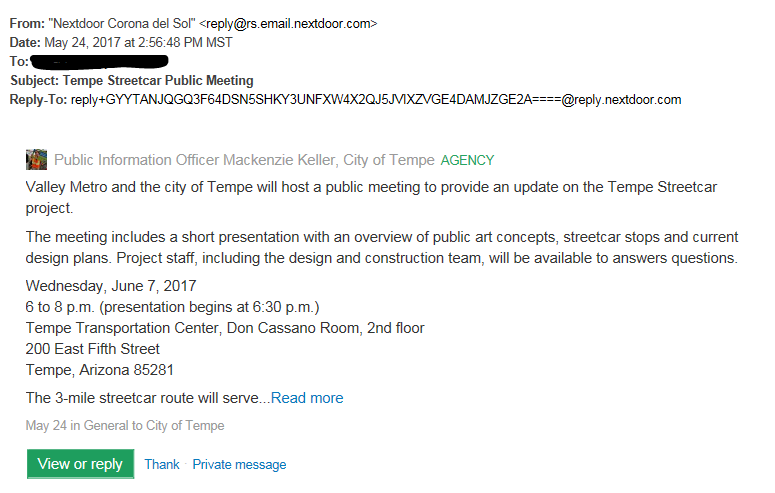 Most importantly, we are hoping Ms. Maja Aurora, Tempe’s arts manager, has time in her busy schedule to plan the artwork along the streetcar route the meeting promises us.